Our smart and sophisticated refrigeration range has been developed to preserve the freshness of your food for longer. Featuring everything from intelligent Blue Light technology that maintains the vitamin content and freshness of your fruit and vegetables, to water and ice dispensers that let you enjoy chilled water and ice at your leisure, our refrigerators aim to bring harmony to your life at home. 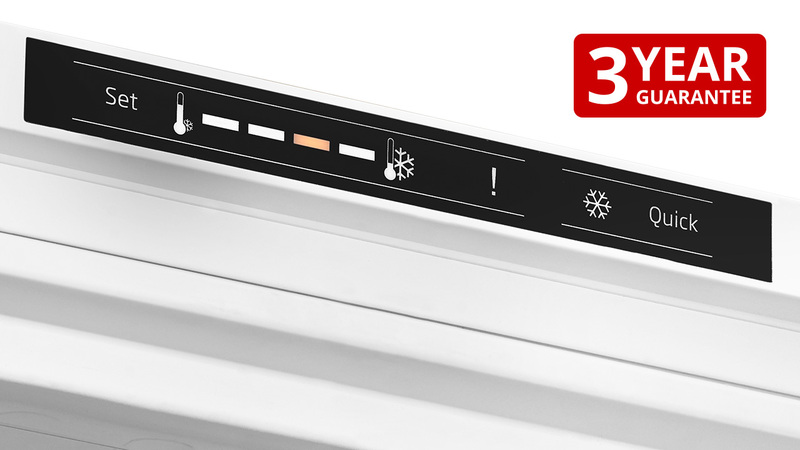 Specially designed to simplify your life, Frost Free technology automatically maintains a dry environment in our freezers to prevent ice from building up. Prioritising the longevity of your food’s freshness, our Blue Light technology continues the natural process of photosynthesis in the crisper drawer to ensure your fruit and vegetables stay fresh long after they’re bought. Providing increased protection, all our refrigeration products are manufactured with either a metal flame retardant back or an aluminium foil covered flame retardant back, exceeding UK and European safety standards. Total customer care - our commitment to your satisfaction. The Blomberg range not only incorporates the latest technology and style, every product has been designed from the ground up to give a long life of outstanding performance. All Blomberg freestanding and built-in appliances come with a 3-year parts and labour guarantee as standard, and, for built-in appliances purchased through a Euronics Retailer, we offer 5-year guarantee when you register your appliance.